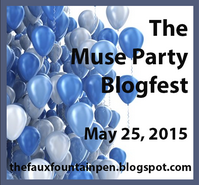 Le&ndra Wallace: The Muse Party Blogfest! The lovely Sarah Foster over at The Faux Fountain Pen is throwing a blog hop to celebrate four years of blogging! Congrats, Sarah! Casual! I'm wearing a short jean skirt (not that short) and a lace top and cute sandals. Darcy's got on work-out pants and a tank top. Yes, lemon bars! Gooey ones with powedered sugar across the top. Darcy...? Oops, I forgot. *cringes* Performers are on a strict no-sugar diet. Rules of Mo, the Key Chain Gang owner. So forget the lemon bars! We're going with some apples and a cream cheese dip... Okay, okay! Sheesh. Just the apples. I'm not much of a drinker, so I'm going with a diet vanilla pop. I can drink you under the table with those. Darcy's also passing-- practice starts early in the morning. If it was the performer's free time, he'd go w/a beer, maybe. We don't sing out loud in other people's hearing. Hahahaha-- never. Darcy said you'd only see it from him if he lost a bet. To join in the fun, or read about more muse/characters pairings, check out this list! I can't even do a handstand so I'd have to pass on that party game, lol. Yeah, me neither! =) Though even when I was 40 lbs lighter as a kid, I couldn't do them. 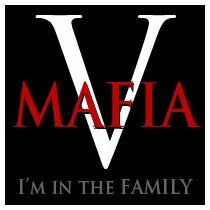 And you're welcome, glad to be apart of the fun! It was! Sarah did good. Bring the lemon bars anyway - I'll eat them. Awww, I love lemon bars. Can't you bring some and the apples too? There wasn't a rule that it had to be only one item. So fun! Your muse is so interesting! Call me the minority, but I'll take a perfect apple over a lemon bar pretty much any day! "Pretty sure that if I called you the minority, I'd get accused of being racist," says Will Scarlet. "Which is bogus as hell, since I'm totally your soul brother, and should therefore count as at least half-black in spirit, but whatever. Hey, wallfly! If I beg adorably enough, will you show us some acrobatics? ^^"
Ha! This is so fun and funny! Love the voice in it! Fun interview :) And I totally think wallfly should be a thing. They all want to be our favorites, don't they. Don't worry, Darcy, she'll get back to you soon. Thank you! It works quite well, I will admit. =) And...um, thank you for the duck fat? Lol! Darcey sounds extra sweet, so no need to eat sweets. Yum lemon bars. I would have eaten those. I will eat any lemon dessert. Always. Ooh I do love aerialists.. I bet he can hold that handstand for a long time! Lemon bars...yum! I'm loving this blogfest. Desserts make parties (and blogfests) all the merrier! Darn. I love lemon bars! WallFly should definetly be a thing! Nice to meet you, Darcy! I think I just ate those lemon bars a few days ago on vacation--best ones I've ever had (and they were gluten-free)!